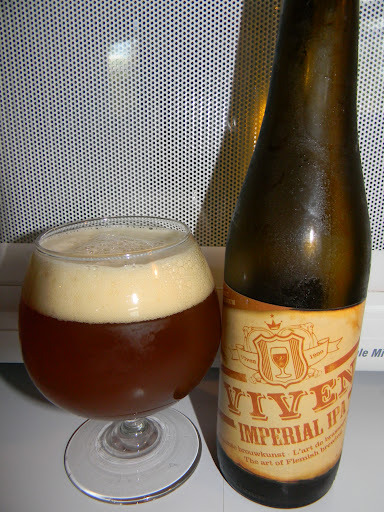 Review of Viven Imperial IPA | Beer Apprentice - Craft Beer News, Reviews, Interviews and Info. ← Review of Dieu Du Ciel Rigor Mortis Abt. Hi guys. For today’s craft beer review I’m going to be trying the Viven Imperial IPA produced by the Brouwerij Van Viven located in Sijsele, Belgium. Unfortunately, I have yet to ever try anything from these guys, so this should be an exciting experience for me. From the breweries website, viven.be, we find this bit of information concerning the Imperial IPA. Viven Imperial IPA is originally from the west coast of America. This recipe, combined with the Flemish brewing art, has an excellent result. It does many beer lovers’ hearts beat faster. It is a bitter hunk with a beautiful balanced of citrus keys (especially pink grapefruit) and floral tones. A true experience for the senses…. Let’s drink it, shall we? This brew has an ABV of 8.0% and it comes in an 11.2 oz. bottle. The Viven Imperial IPA poured a cloudy, deep orange to amber color. The cap was off white, soft, mostly creamy and nicely compacted with small bubbles. The retention time was excellent and the lacing appeared to be patchy and clingy. A touch of clear alcohol legs were found on the sides of the snifter when tilted. It settled to a thick ring around the top of the liquid. It looked pretty good I thought. The nose divulged a nice and juicy aspect of grapefruit and peach citrus. A piny redolence was accounted for as well. Some underlying caramel malt provided a subtly sweet scent while an earthy hop and somewhat woody fragrance added a pleasant twist for my nostrils. The taste brought forth a solid dose of the citrus. Grapefruit and peach again. I found it to be quite resiny and piny (in a good way), although the bitterness wasn’t as forceful as I thought it might be. A sturdy bit was accounted for though. The soothing caramel sweetness was harmonized extremely well. It wasn’t nearly as much as some of this style can provide. Only a minor savor of alcohol was found and, again, I stumbled upon a very interesting woodiness that seemed to fit perfectly with the style. The mouthfeel was medium bodied. Considerably dry, smooth, somewhat sticky and chewy. The carbonation was satisfactory and no real warmth was felt from the alcohol. An excellent amount of flavor was left behind on the palate after each sip however. I’ll tell ya. I think we have a very nice beer right here. It might not be the best Imperial IPA I’ve ever tried, but there is no denying that it packs plenty of substance and allure for me to want to try it again. The drinkability is quite high and it could be enjoyed at any point during the year in my opinion. I would definitely recommend this to any craft beer drinking friend for sure. I’d suggest that you guys give the Viven Imperial IPA a try if you see it as well. I think you may like it. The earthy/woody feature was a very nice facet I thought. Be sure to let me know what you think of it once you give it a sample.